There’s been some absolutely brilliant sci-fi movies out of late. From ‘The Martian’ (Ridley Scott) to ‘Interstellar’ (Chris Nolan), they’ve all started to move away from the classic invasion-style plots, and are instead going a lot deeper both narratively and philosophically. ‘Arrival’, directed by Denis Villeneuve, is another one just like that – a clever mix of science, philosophy, and wonderful visuals that combine together to create something magnificent. Dr. Louise Banks (Amy Adams), linguistics expert, is about to start a lecture when she’s urged to turn on the news. No one really knows what’s going on, but it seems that alien life has finally infiltrated the Earth in the form of 12 giant floating vessels (somewhat reminiscent of the monoliths in ‘2001: A Space Odyssey’). Dr. Banks is approached later on by the US Military to help translate the communications from the aliens, and so ends up travelling to the off-limits location of the nearest vessel in Montana, where she works alongside theoretical physicist Ian Donnelly (Jeremy Renner) to find out why the aliens are really there, and learns more than she bargained for along the way. ‘Arrival’ isn’t just part of a wave of original sci-fi films, but so much more than that. The key part of the plot this time round is language – something that usually isn’t focused on too much. It’s a fascinating concept that hasn’t been explored enough in filmmaking but certainly makes you think… If we were to meet an alien race, then how on earth would we communicate with them? It doesn’t just focus on talking either, but communication through words. The heptapods, as they’re named, have their own form of written language that is wildly different from our own, which makes the whole communication thing challenging, to say the least. These scenes where human and heptapod communicate through writing are the ones that really stand out in the film, as they hold an immense gravity that is captivating to watch. Adams and Renner are fascinating in their roles as Banks and Donnelly, commanding the screen in a calm and inspired manner that leaves you holding your breath in anticipation. There’s a constant sense of foreboding as tension grows between certain human races which, when combined with the suspense of the scenes with the aliens, renders it near impossible for you to switch off from the story. It's not just the storyline that explores the theme of interpretation either, as the mid-film reveal leaves us questioning how we interpret things in a visual sense as well. Both the plot and the imagery intertwine beautifully, resulting in a profound look at language and science and the links between the two, and how it’s so easy to get something wrong by only looking at it from one perspective. It has an underlying message as well: don’t jump to conclusions, and never assume. It also highlights just how important communication is whether it be between species or just humans, and portrays how easy it is for us to switch off from that. Topical really, despite the fact this was filmed just under two years ago. The other thing I have to mention is the beautifully sublime soundtrack that we’re treated to by Jóhann Jóhannson, who is fast becoming one of my favourite composers. He also composed the soundtrack for ‘Sicario’ (also directed by Villeneuve) which was released last year, and yet again shows just how much impact a strong soundtrack can have on a film. 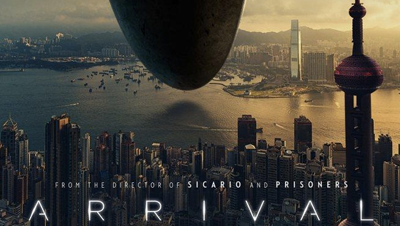 ‘Arrival’ one of those films where you won’t see much action, but it’ll leave your head full of questions. Less for those that ask “What?” and more for the thinkers who ask “Why?” and “How?”, it’s hard not to appreciate such a sophisticated depiction of alien contact.